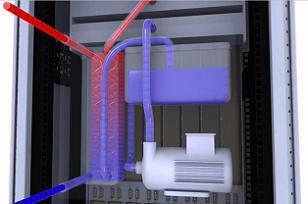 Greenbang has an article on liquid cooling. If you’ve ever accidentally spilled tea on your laptop, you understand why liquids seem like one of the things you want to keep out of data centres, not in them. But one firm says surrounding server components with water and liquid coolant is an ideal way to save energy and money. The UK-based Iceotope launched its new liquid-cooled server technology today at the Supercomputing 2009 conference in Portland, Oregon. Iceotope claims its system is the first to use modular “liquid immersion” of server components and can reduce data centre cooling costs by 93 per cent. That’s no small feat when you consider a data centre with around 1,000 servers can spend more than $260,000 a year on air cooling systems. The claim of 95% savinsg is mentioned on their web site. Because of the greater thermal efficiency of this “end to end liquid” cooling path, the building water circuit can be run much warmer – potentially eliminating the need for chiller plant and enabling year-round free cooling. With this approach, the 3 year cooling cost of a 1 megawatt data centre could be reduced from around $788,400 to around $52,560; a 93% ($735,840) reduction compared to air cooling. By enabling servers to be packed more tightly without compromising the cooling efficiency, the same approach could reduce the space required for the servers by 84%. I am amazed companies make claims like the above without any transparency on how they came up with these numbers.